Welcome to October! Before you know it, Christmas will be here. Personally, I think that the better prepared you are for Christmas, the more likely you are to enjoy it. Over the last few years our family has developed some internal rules that help us make decisions regarding Christmas. Honestly, I cannot identify with people who buy all of their Christmas gifts on credit. For years and years, I've known of families who are trying to get out of credit card debt who continue to spend more than they can afford on Christmas gifts. This may make for a decent December, but a horrible January. If you've ever read or watched a version of A Christmas Carol, then one of your greatest fears may be that people are going to look at you and think you are just like Scrooge. As a result, we give what we do not have and buy gifts on credit. You can communicate love for someone by giving them something that does not cost a penny. Somehow we've muddled love and spending together. As a result, we think those who spend money on us love us. When I've written about how to make a Christmas budget, I suggest that people write a long list of everyone they want to give a gift to. At the very top of the page, write your total Christmas budget. If, for example, you plan to spend $500 for Christmas, then write that at the top of the page. Now allocate that $500 in portions to each person who will get a paid gift like a store bought item or a holiday gift card. Now review the names on your list and write one thing you can give each person. It might be a card, a homemade gift, or something you can give with your time, energy, or talents. Some people may just get a thoughtful card, others a gift that doesn't cost money, and others a gift that requires money — but everyone can get a gift. If you haven't already, you'll soon start noticing all the Christmas decorations in stores (crazy, I know). Even though those decorations are being put up outrageously early, they can be a positive mental trigger. Christmas is coming. If you don't start saving now then how can you possibly have an all-cash Christmas? You might consider taking the total dollar amount you have to spend on Christmas and dividing that number by the number of months between now and Christmas. Since it is October, you would take your Christmas budgeted amount and divide it by three. Thus, a $500 budget would require you to save about $165 each month between now and Christmas. Is that possible? If not, you may need to decrease your budget. 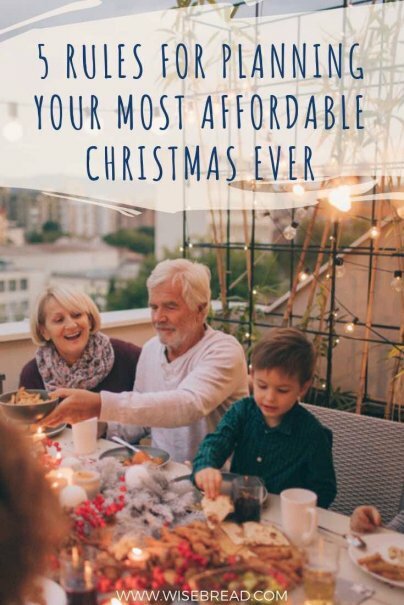 What tips do you have for making this your most affordable Christmas ever? Great Article! I forgot that I should start planning for christmas already and if I start saving now, it will be less damage done in december. My wife and talked about a suggested allotment for each of our family members. If we look for good deals now, we can spread out that allotment over three months. Good Advice. Nice article! My wife and I started saving $20 here and there from extra gigs and side jobs and already have $200 of our $400 Christmas budget saved - in just 2 months! Be consistent. It's easy to want to swipe one of the $20 bills from the Christmas jar, but you have to resist the urge and push yourself to add little by little. Let family know. If this year is tight for your family and you can only afford to bring a plate of cookies or a small purchased gift, just let others know. You'll feel better without the pressure to bring a huge gift, and everyone might take a moment to reflect back to the real reason why we give gifts - because God gave the greatest gift - His son. I have done several things this year that is different from years past due to my income dropping 50-75% since my hours have been cut. I let family know that I can only buy for children in families. That has cut my need to buy drastically. For the remaining adults (like mom), I will buy food gifts since they are practical. I find nice discounted baskets for under $20 online. Alot of stores offer sales and even have coupons for additional discounts on sale items, which is helpful. Some stores have layaway, so ask each store about that. I work in retail and get a 50% discount on merchandise, so I have purchased presents already. I have told my children that they are getting a certain amount of cash this year. We also have rewards programs from our credit/debit cards, so I will use the points to buy free gifts. Overall, I'm spending $35 per person this year, out of my pocket. Our strategy this year is to limit our gift-giving between my husband and I to $100..it may sound like alot, but it was a compromise to gving enough leeway for "real" gift giving, without eliminating the excess of "many" last minute gifts. hopefully, it works! Stephanie - my husband and I limit ourselves to $150 on gift-giving between each other. It makes you think about what you really want and DOES eliminate the excess of last-minute gifts. I think some folks just aren't disciplined about drawing the line re: how much to spend on someone, etc., and that's where they get into trouble. Gregory Karppersonal finance columnist for the Chicago Tribune suggests spending just 1.5% of your gross income on the holidays, including gifts and travel. I always thought that was a good, personalized guideline. thank you for these helpful tips. Staying disciplined, even during the holidays, is important. It is a wonderful time of year and nice that people feel generous and want to give, but it shouldn't be at the expense of the budget or financial goals. Once you have your list made, be diligent in sale-watching. I have nieces & nephews that love video games. Often the full price is $50, but by watching Amazon Goldbox deals daily starting about now & keeping up with what's expected for Black Friday (I use bfads.net), I can usually get them for @ $25 average. Another great thing about Amazon is that I signed up for the free Amazon Prime for students so there's generally no shipping charge. Finally, I use www.southernsavers.com all year long to get items practically for free by shopping CVS (mostly) & Walgreens (some). These items are suitable for stockings (soft socks, headphones, etc) or charitable Operation Shoebox giving (toothbrushes, hair bands, etc). It all just takes planning. I set aside - starting in January - $5 per week in an envelope marked simply 'x-mas'. By the time December rolls around, I typically have $250 or more set aside to Christmas shop for family and friends. I also set a dollar limit on what I spend on family members and friends. Also, my husband and I save most of our pocket change throughout the year and we each put $5 in the jar the 1st of each month. Since my husband and I limit ourselves to $150 for gift-buying for each other, the pocket change and monthly $5 donation adds up fast. As tim@faithandfinance said - be consistent and discipline yourself. Once the money is gone, you are done with your Christmas shopping. In these tough times, I don't think anyone expects lavish gifts. 1) Use a gift card exchange (like http://gifts.cardhub.com/us/gift-card-exchange/ ) to sell your unwanted gift cards for cash and to buy gift cards at a discount. 2) Use a cash back credit card that you plan to pay back in full at the end of the month. In that way you get the cash back rewards without incurring interest or going over your budget! I love buying new books from second hand booksellers. You've got to look carefully, but often there are some great deals. I have a box full of Christmas books waiting for my family: novels, coffee table books, a boxed, illustrated hardcover Hobbit, how-to books, all for under $20! I keep my eyes open for this all year, but spend no extra time. Great tips! So many of us get in over our head during the Holiday season. We love to give and we love to get but we sure hate when that credit card statement arrives in the mail come January. I think the key to successful holiday gift giving is communication with your family. Let them know the game plan so feelings aren't hurt and expectations are in line with reality. Remember to start saving up a few months before christmas starts and start looking around at gifts. When they go on sale, you then buy. Don't waste last minute.